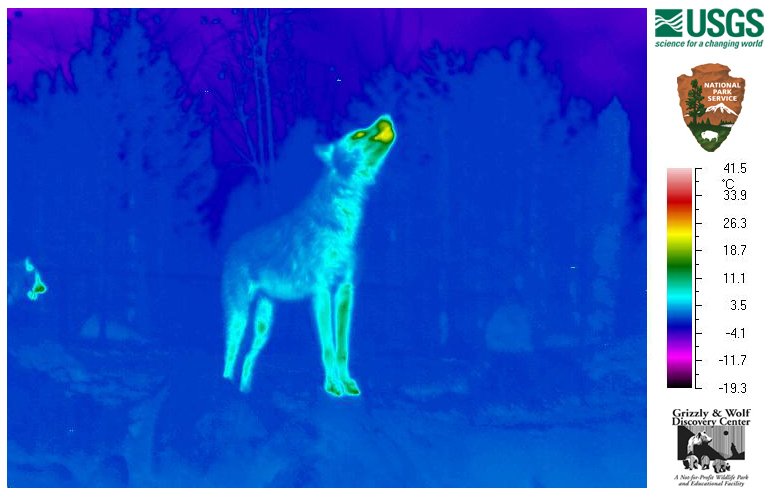 The warm muzzle of the howling wolf is yellow in this thermal image of a captive wolf at the Grizzly and Wolf Discovery Center in West Yellowstone Photo: Courtesy USGSMost wolves in Yellowstone National Park sport a grey or black coat, but new photos of thermal imaging reveal the animals in a captivating rainbow of hues. The colorful canine displays are the result of recent testing with thermal imaging on wolves at the Grizzly and Wolf Discovery Center. Paul Cross, USGS Disease Ecologist, and Doug Smith, leader of Yellowstone’s Wolf Project, intend to use the technique in an upcoming study to help determine how mange impacts the survival of Yellowstone’s wolves. Click on the image to view a thermal video of two wolves (Courtesy USGS)About a quarter of the wolf packs in Yellowstone are afflicted with sarcoptic mange, a highly contagious canine skin disease caused when the mites burrow into the skin causing infections, hair loss, severe irritation and an insatiable desire to scratch. Although the disease itself is not fatal, the resulting hair loss and depressed vigor of the animal can often lead to the potentially life-threatening conditions of hypothermia, malnutrition and dehydration. Beginning in February, the research team will establish remote cameras in the backcountry of Yellowstone National Park to help them better understand the infection rates from year-to-year, the role mange plays in the lives of the wolves, and the reasons why some wolves recover from the disease while others succumb.